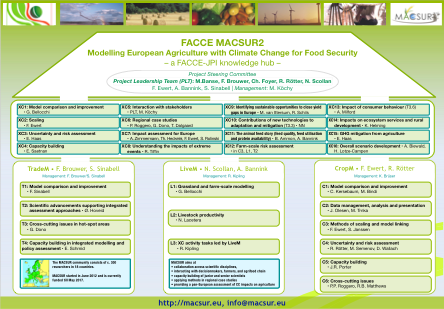 MACSUR is a knowledge hub within FACCE-JPI (Joint Programming Initiative for Agriculture, Climate Change, and Food Security). The FACCE-JPI Scientific Research Agenda defines five core research themes to address the impacts of climate change on European agriculture. MACSUR gathers the excellence of existing research in livestock, crop, and trade science to describe how climate variability and change will affect regional farming systems and food production in Europe in the near and the far future and the associated risks and opportunities for European food security. A knowledge hub is an innovative, tailor-made instrument developed by FACCE-JPI, associating 3 complementary dimensions: networking, research and capacity building. The knowledge hub consists of 70 institutions from 18 countries. The overarching challenge is to develop a pan-European capability in the development, use and interpretation of models to perform risk assessments of the impacts of climate change on European agriculture. The project focusses on the technical and informational integration of suitable existing models and their application in regional case studies that reflect the European diversity in soil, climate, socio-economy and agricultural systems. 1. Identify and address a range of issues between models in different themes to enable their closer integration including issues of scale and data processing. 2. Train a new generation of scientists to work across models which contribute to greater integration of models. This challenge can be described as focusing on the creation of integrated modellers as opposed to integrated models. 3. Determine the contribution that can be made to reducing uncertainty over the impacts of climate change on European food security by adopting integrated models of crop production, animal production and trade. The work in MACSUR is organized in three "Themes" on the modelling of crops, livestock (including permanent grasslands and farms) and the socio-economy. In addition, there are cross-cutting activities for integrating knowledge across disciplines. MACSUR organizes workshops and major international conferences for knowledge exchange among experts. MACSUR co-operates closely with other international research networks like AgMIP and interacts with political stakeholders. Expected outcomes of the project is a procedure for integrating models, assessment of climate change impacts on agricultural production in European case studies, and an assessment of how uncertainty in modelling climate change impacts on European agriculture could be reduced further.